Breakfast at Peach Cafe, on the north side of Colorado just west of Ivy. Got the 2+2 and a cup of coffee, $9 for both. Good. And bacon really excellent. Lunch at Los Chiles Loco, at the corner of Myrtle and Duarte Road, next to the car wash. I got a Panzon Burrito (beef, beans, rice and a chile relleno) for $8.25 and a horchata for $2.75. This is a taco stand, so no indoor seating. Big! Enjoyed every bite. Lunch at Something Healthy Cafe , on the east side of Shamrock just north of Huntington. Got the Southwest Salad for $9.25 and for $2.25 upgraded from a bag of chips to a cup of coconut curry soup. Nice outdoor seating for pleasant days. The food was really excellent! Why don’t I come here more often? Lunch at Baja Fresh, on Huntington at Fifth. Got a BBQ chicken salad for $8.69 and an iced tea for $2.29. Nice, and as the name says, very fresh. Lunch at Mooncat Ranen, not to be confused with Mooncat Sushi next door. It’s a cozy little place on the south side of Lime just east of Myrtle. Got the Curry Ramen for $11 and an almond milk-tea for $4. Very nice. Dinner at Sushi Kuni, on the east side of Myrtle just north of Olive. Got the Spicy Pork plate for $15.50 and a beer for $4.99. Delicious, and prompt, friendly service. Dinner at the Mayan Restaurant, in the Aztec Hotel at Foothill and Mayflower. Got the Seafood Combo for $19 and a beer at the happy hour price of $2.50. It was a bit of work shelling, but worth it. Very tasty. Also, without our ordering it we were given a free, beautiful and delicious cheesecake dessert. Lunch at Copper Still Grill, on the east side of Myrtle about a half block south of Colorado. Got the Chicken Ranch Wrap with a Salad for $11 And a beer for $5.75. Very good! And my wife said her chicken pot pie was the best she’d had on a long time. Lunch at X2O Cafe and Hookah Lounge, on the north side of Foothill just west of Melrose. Got the Chicken Schawarma Sandwich for $10 and an iced tea for $3. Delish! And friendly, prompt service. Lunch at Nano Cafe, near the northeast corner of Duarte and Mayflower. 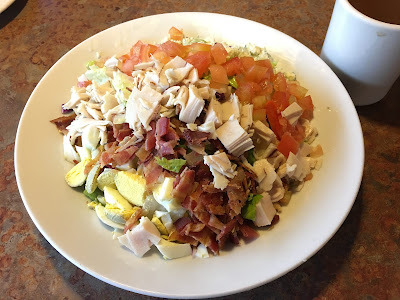 Got the Cobb Salad for $12.99 and a coffee for $2.79. Tasty, filling, and cheerful service. Lunch at 38 Degrees, on the south side of Colorado about a half block east of Myrtle. Got the Roasted Chicken Sandwich with lentil soup as the side from the lunch menu for $10 and a beer for $7. Delicious! Lunch at Popeye’s, Cajun style fast food near the corner of Huntington and Magnolia. Got the Cajun Fish Combo with cole slaw and an iced tea for $8.29. This is definitely fast food and for fast food it was fine. Lunch at T Phillip’s, at Myrtle and Colorado. Got the Pulled Pork Quesadilla for $13 and a beer for $6.50. Cheesy, porky, and very tasty! As you can see, I got a bit eager and ate half my eggs before remembering to take a picture. 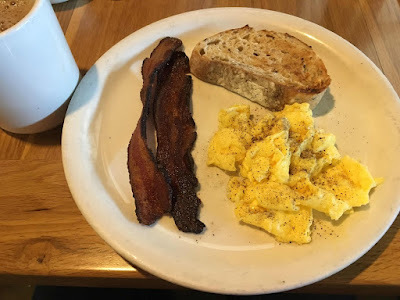 Anyway, had breakfast at Jake’s Road House, on the east side of Myrtle just north of Olive. Got the sausage and eggs plate for $9.95 and a coffee for $2.95. Nice, filling meal, good service. Dinner at Basin 141, a new sports bar at the southeast corner of Myrtle and Lime. Got the Black Angus Basin Burger for $13 and a happy hour beer for $4. The atmosphere is bright, lively and modern. Nice service and my burger was excellent. Had Thanksgiving dinner at home, but the feast was from Mimi’s, at Huntington and Mayflower. We got a meal for 8 to 10 people for $104.99. A whole turkey, gravy, stuffing, mashed potatoes, sweet potatoes, green bean casserole, cranberry apple relish, two carrot nut loaves and a pumpkin and a pecan pie. Excellent. Turkey nice and moist. Dinner at Cafe Mundial, on the east side of Myrtle about a half block north of Colorado. Got the seared Ahi for $24 and a beer for $7. That was a big Ahi steak!, and nicely cooked. Tasty. Very nice service as well.